After trying some mods to improve visuals and get something more realistic looking, I transformed KSP into something really good looking, but I was really happy with the result, but I felt that something was still missing. When in low orbit of a planet, the side of my ship which was facing the planet was completely dark, which was not realistic! It should have been illuminated a bit by the planet's own reflective light! I decided to fix that with this mod, by making planets and moons to reflect their own (colored) light to your vessel. When you are close to a planet or moon, its bright side reflects (colored) light to your vessel. More realistic ambient light in vacuum, very dark by default, can be customized. More realistic ambient light on the ground and atmosphere of planets/moons, tinted by the surface color. Settings menu to customize many parameters, as well as several quality/performance settings. Support for the Toolbar mod. Planet and moons light configuration supports Module Manager and loading across GameData folder, and can be easily customized by players or other mods. Conflicts with the mod "Ambient Light Adjustment" because it has exactly the same feature: custom ambient light settings with a slider. When close to the sun, the sunlight becomes dramatically intense. Environmental Visual Enhancements for clouds and city lights. Oinker's Skybox (requires Texture Replacer) for a more realistic and much darker skybox. Scatterer (WIP - Experimental - Might have issues with E.V.E.) makes the sky and atmosphere looking great and much more realistic, sunsets become amazing. Engine lighting for adding realistic lighting to engines thrust. Surface Lights to illuminate the ship when it gets really dark (you may have to raise "pixel lights count" in KSP settings). I would appreciate feedback on this mod a lot! I spent a lot of time trying to make this reflected light to behave as consistent as possible, and I think it's pretty well tuned by now. Planet and moons colors are all editable in "CelestialBodies.cfg", and you can change a few other settings in "Settings.cfg", such as the vacuum light level (quite low by default), and the reflection light intensity. Compatible with all game versions from 0.25 to 1.0, and probably older versions as well. - fixed a bug that prevented the stock toolbar icon settings to be saved correctly. - fixed a bug that sometimes displayed unintended atmospheric lights on all other bodies when in map/orbit view. - a bit of code cleaning and refactoring, might even improve performance and stability. * other plugins can programatically change "PlanetshineCelestialBody" nodes through "GameDatabase"
- Added support for Add-on Version Checker and included "MiniAVC"
- renamed the mod from "Reflective Ambient Light" to "Planetshine"
Might have minor issues with Kopernicus, which optionally provides custom atmospheric and vacuum ambient lights. please "excuse my French", English is not my native language. Can u please update it, to 1.3? This mod is really good, but i need it in 1.3 . Where can I see how looks the other 3 mods from this developers? 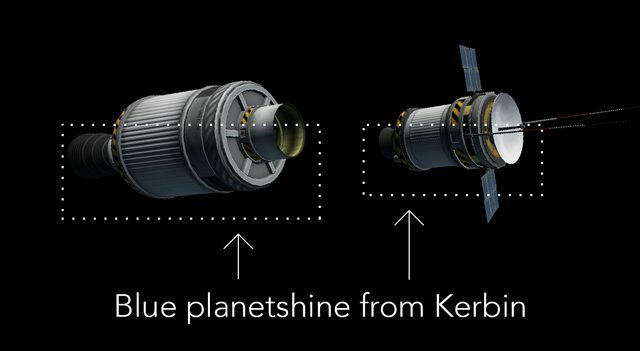 Please note that PlanetShine will most likely always be compatible with KSP 1.0.x future version, even if there is a warning.